Rancholabrean: Fourth and Mesa streets, San Pedro (Jefferson 1991b); West Coyote Oil Field (Jefferson 1991a). Sangamon: Fourth and Mesa, San Pedro (Jefferson 1991a); General MacArthur Blvd. (Jefferson 1991a); U. S. Veterans Hospital, Long Beach (Jefferson 1991b). This is a large duck about the size of a Canadian Goose (Miller 1925). The type, from Long Wharf Canyon, is a tibiotarsus; a tarsometatarsus was associated (Miller 1925). It eventually became clear that Chendytes was flightless, with greatly reduced wing elements (Howard 1947). The duck survived into the late Holocene (between 2 and 3 kya); remains in a number of Indian middens indicate exploitation by humans, eventually resulting in extinction (Jones et al. 2008). 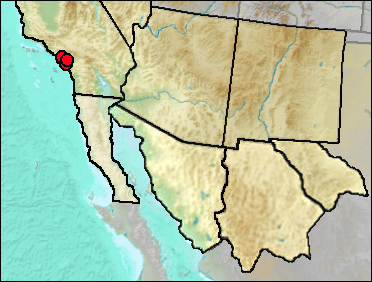 Rancholabrean: Anacapa Island (Jefferson 1991a); San Pedro Lumber Yard (Jefferson 1991a). Sangamon: Bixby Slough (Jefferson 1991a); Chandler Gravel Pit (Jefferson 1991a); Lincoln Ave (Howard 1936); Long Wharf Canyon (Jefferson 1991a); Pacific Ave. and Second (Jefferson 1991a); San Pedro Lumber Co. (Jefferson 1991a); U. S. Veterans Hospital, Long Beach (Jefferson 1991a). Literature. Guthrie 1998; Howard 1936, 1947; Jefferson 1991a; Jones et al. 2008; Miller 1925. The type locality is described as "top of bluff on north side of San Nicolas Island, S 47° W of Coney Point; altitude approximately 400 feet. Lower Pleistocene." The holotype is a humerus, but some 70 elements have been collected (Howard 1955). When compared to Chendytes lawi, "C. milleri appears to represent a developmental stage between a flying, scoter-like ancestor and the flightless C. lawi". Howard (1955) speculated that C. milleri may represent an evolutionary stage in the development of C. lawi. Rancholabrean: San Nicolas Island (Jefferson 1991a). Literature. Howard 1955; Jefferson 1991a.